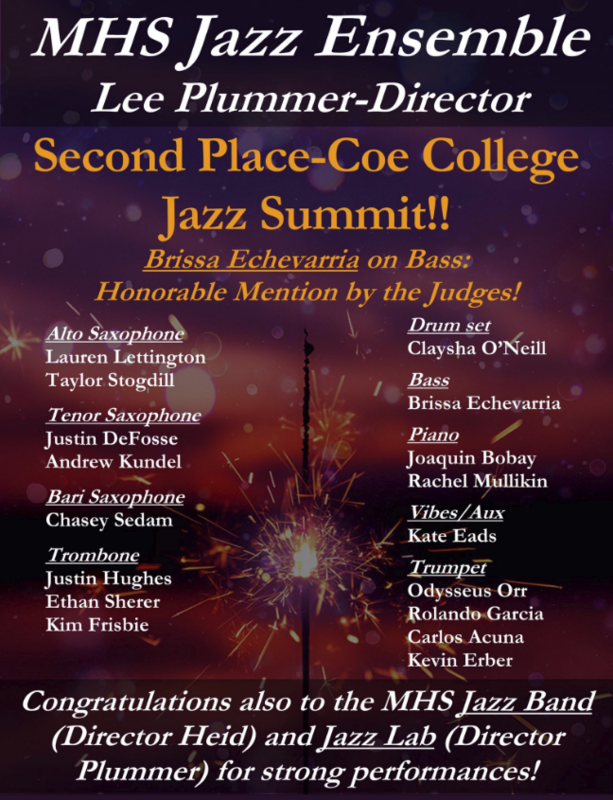 Congrats to the MHS Jazz Ensemble for finishing 2nd at the Coe College Jazz Summit! This is the first time that the Jazz Ensemble has placed in the top 3 at Coe. Congrats to RCR for placing 4th at the Marion Show Choir competition. Boys’ Soccer Meeting will be held on Thursday, Feb. 28 at 3:45pm in the Library Cafe. MHS Band and Orchestra Pops Concert, Thursday, Feb. 28 7-9pm, MHS Auditorium. MHS Spring Band Concert, Friday, March 1st, 7-8:30 pm MHS Auditorium. Boys’ Soccer Player/Parent Meeting will be held on Sunday, March 3 following boys’ open gym at 4pm in the Commons.